Have you ever wondered why your posts take longer than usual to index on some search engines? This could be due to lack of updated WordPress ping list. Whenever you publish or edit a post, WordPress sends a ping to all the services listed under your website Settings>Writing Settings>Update Services. This helps search engines to index your post for search results. By default, WordPress has listed http://rpc.pingomatic.com/ and ping to all major Update Services. One can also add these Update Services manually to extend the reach and faster post indexing. I have shared my updated WordPress ping list below. Feel free to use it. If you need help, scroll to the bottom of the page for step by step instructions on updating WordPress Update Services. First, log in to your WordPress Administrator Dashboard. Then go to Settings and click on Writing Settings. Scroll to the bottom of the page to the section “Update Services”. 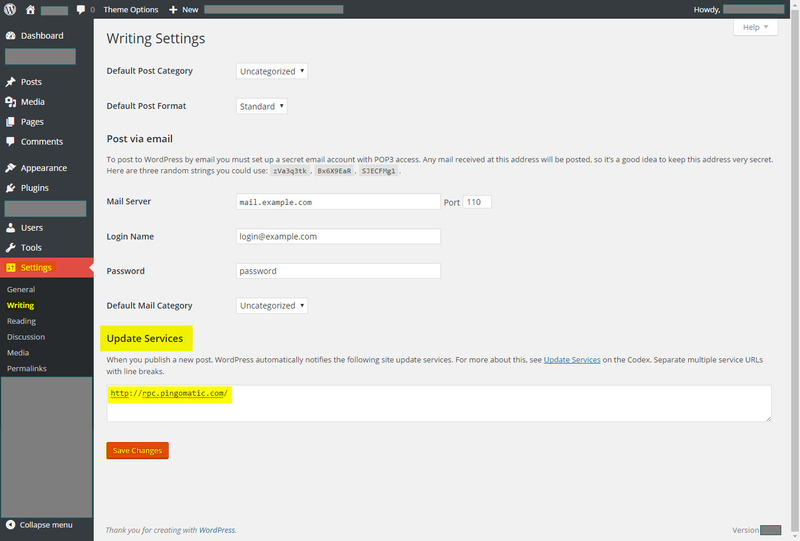 Copy and paste the updated WordPress Ping List above and click “Save Changes”. That’s it! Now WordPress will ping out to all the Update Services when you post, edit, or delete a post. If you have any other update services I failed to mention above, please put it down in the comments below. I will check the links and add them to the updated WordPress ping list above. If you have any questions or comments regarding WordPress Update Services, put them down in the comments as well. I will try to answer my best.